I came across an interesting article the other day on the BBC website. It was about sea silk, a fabric I had never heard of although it is associated with great luxury and has an origin steeped in controversy. Unlike the silk manufactured from cocoons spun by silkworms, this opulent, rare and delicate material is from the beard-like fibres found on pen shells (particularly the Pinna nobilis, the largest shellfish living only in the Mediterranean). This bundle of fine, tear-resistant fibres, known as the byssus is secreted from a gland in the foot of the shell and can grow to a length of 20cm -30cm. Each silky fibre ends with a fan shaped trap, unlike the adhesion plate found on other bivalves. 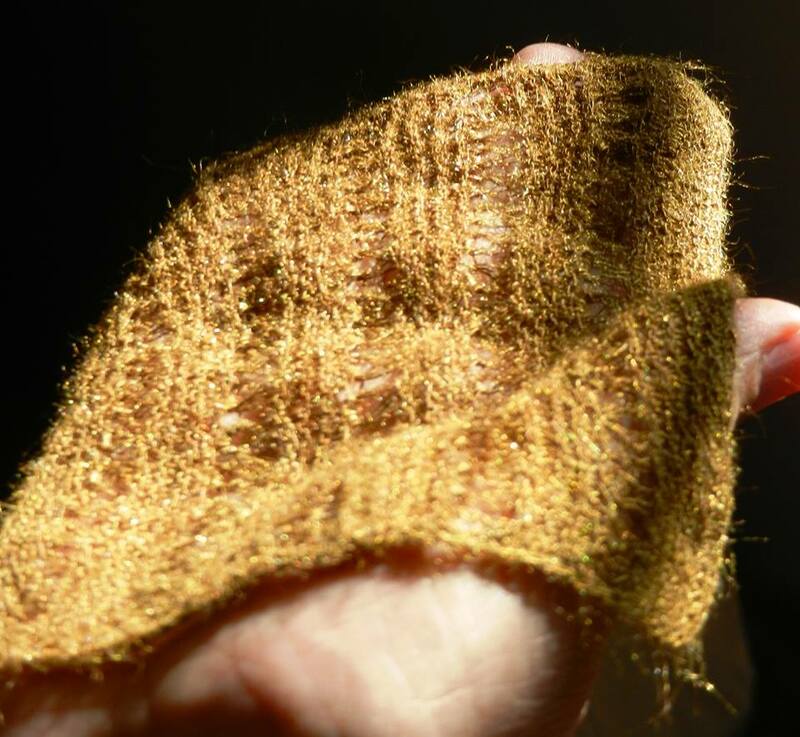 It is these fibres that when cleaned give a gold-bronze to olive-coloured sheen to the silk. The origin of sea silk is still puzzling, inherently due to the name “byssus” which not only refers to sea silk but “was – and still is – used primarily for fine ancient textiles in linen, cotton or silk“. Unsurprisingly, this ambiguity has led to much confusion when reading old texts such as the Bible. With the verdict still out as to whether or not sea silk production was in process during classical antiquity (or before), one thing we do know is there was some kind of production going on in late antiquity; with proof being a piece of 4th century sea silk, found in Aquincum, today Budapest. A piece of fabric by Chiara Vigo stored at the museum of fine linen of Sant ‘ Antioco. (Chiara Vigo Facebook). 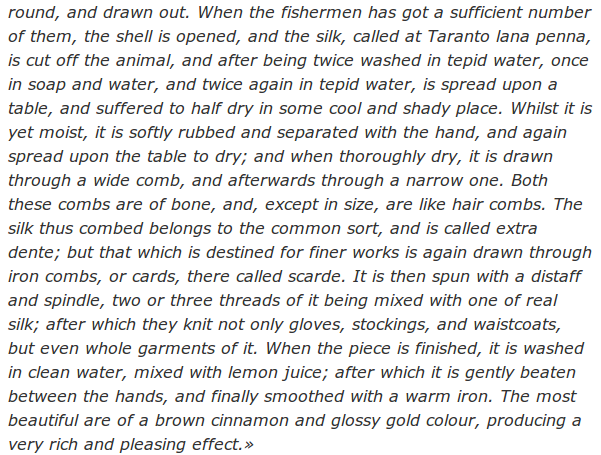 With the rarity of sea silk it seems that it was only ever a small scale industry (unlike the molluscs utilized for the famous purple dye); which after 1900 centered around Taranto and Sardinia. 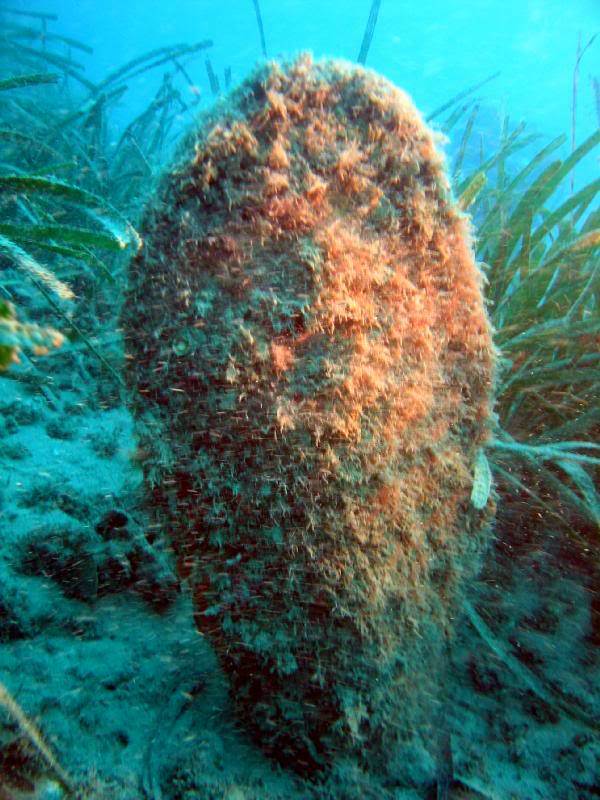 Today, we are left with the nobel pen shell being protected and only one person able to harvest and spin the sea silk byssus, Sardinian Chiara Vigo.